Just this weekend I got another visit from my friendly neighborhood police man. This was the second visit this year, although my wife had the pleasure of handling the first one. Now you may ask. What heinous crime did I commit that warranted a visit from Nagano's finest? Was it lazy garbage sorting? Or perhaps downloading pirated music? Nope! Actually it was just the police paying a courtesy call the let me know about recent robberies in the area. You may be wondering why the Japanese police decide to stop by the houses of otherwise law-abiding citizens? This custom is known as junkai renraku (巡回連絡) or keisatsu homon (警察訪問) and has been going on in one form or another seemingly as long as there have been law men in Japan. As you may already know, Japan is a country that prides itself on a strong adherence to public order and safety. Japan has long been the envy of developed countries when it comes to extremely low violent crime and relatively low petty crime. While some of this has been attributed to a strong sense of harmony and community spirit, it's hard to ignore the ever-watchful eye of Japanese law. A police officer is not just someone who arrests you and doles out tickets but also someone who acts as a "community consultant" to whom residents can take their problems. 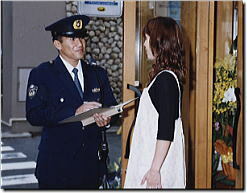 Therefore, police are expected to know all the residents in their jurisdiction (usually the area covered by a police substation or koban 交番). Oddly enough, police visits are actually expected by local residents. I have heard from acquaintances that the mark of a bad neighborhood is one in which the police never bother to pay a visit. This might seem a bit menacing to those of us from countries that connote police visits with patty wagons, but in Japan it's just an important part of the community framework. Regular calendar visits scheduled by the local koban. Sometimes officers assigned to a given jurisdiction are just expected to go around and greet the locals as a regular duty. The frequency of this kind of visit depends on your local police agency. When there is a big event like a robbery or vandalism. Officers will sometimes go door-to-door after a neighborhood crime to give out advice, such as reminding residents to keep their houses and cars locked. When you move to a new neighborhood. Whether or not this will actually happen depends on the policy of the local cop shop. Sometimes, if a new house is built or police notice that "room for let" posters have been taken down at an apartment, they will drop by for visit so they can get acquainted with the new resident. If you hear an officer at the door, its a good idea to answer it. Although police can't enter your house without a warrant, they are quite persistent. Usually only one or two officers will drop by, dressed in full police gear. While police fraudsters are rare, beware of anyone not prominently displaying a badge. Also, look for a handgun since police are pretty much the only people in Japan allowed to carry one. The first thing they will do is ask you for your personal information including name, family members, workplace, phone numbers, and so on. This may sound a bit Orwellian, but it is for "safety purposes" and theoretically can't be used for any other reason. Keep in mind, the police are not here to investigate any crimes, just to meet, greet, and take names. However, this is all technically "voluntary" (ninmu 任務) so you are within your rights to tell the police to scram. But in Japan, some "voluntary" activities are only supposed to be voluntary in name only, and refusing to talk to police might mark you as a "suspicious" individual. Of course they can't barge in and force you to fill out forms, but they can step up patrols in your area or even try to observe your comings and goings. While I haven't heard of this happening from immediate friends, it is best not to get on the bad side of the local authorities. Basically, if you are a civil libertarian type who doesn't like The Man dropping by, then you may be in the wrong country. 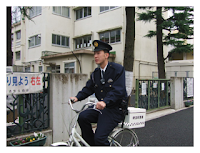 Also, although police cannot enter your residence without a warrant or probable cause, they can look for on-site violations (genba ihan 現場違反) such as cars without proof-of-parking place stickers or bikes without lights or registration seals. Generally they will just give you a friendly warning, but again, it depends on the individual officers involved. In my own experience, officers usually aren't out looking to get people in trouble as that doesn't exactly make for good police-community relations. So as long as you appear law-abiding, you probably don't have much to worry about. As I have mentioned, foreigners tend to be the most creeped out by police visits, especially those who feel that they are being somehow discriminated against. How much truth is there to this? I can't say for sure, but if you are a non-Asian foreigner, chances are high that you stick out around town, especially if you live outside a major metropolitan area. In my experience, police officers have always been pleasant, chatty, and generally interested in keeping me up to speed on the latest public safety information. The information collecting aspect is a bit off-putting, but I try to bear in mind how Japan hasn't traditionally had the "us versus the cops" attitude common in North America. I think a little cooperation goes a long way to being a good neighbor and avoiding the "belligerent gaijin" stereotype. Finally, this is coming from a white person living in Nagano: My own feelings and experiences might not match up with the rest of the foreigner community. If you have anything to share about police experiences, make sure to let us know with a comment below! Generally as you wrote, there is nothing to worry about. If you made any crime- speeding, parking etc. they will treat you as they treat Japanese - but of course they will call for support, just in case. This is Tokyo. My wife an I received a visit recently after living in Ishikawa for a year. It was quite unexpected and puzzling so your article has put my mind at ease. Hello, I know this is an old post, but I thought I would post anyway. I have a friend that apparently "looks a lot like" this other foreigner that was suspected of a crime and they would randomly stop him and question him when he was smoking under bridges and walking or loitering during his lunch hour. I know that they might be using this as an excuse because they don't want to tell him the real reason might be that he looks suspicious to them behavior-wise. But I was thinking that if what the police say is true and he fits the profile of a suspect wanted for a crime or questioning with regard to a crime...do they just stop all the foreigners that match the description to question them without evidence? Do they ever visit a number of foreigners' doors for this kind of situation as well?